World Twitter ranking of the most recommended tweeps based on the #followfriday recommendations. Check who recommends you and who you have recommended. Below we show you the 50 accounts most recommended on Twitter using the common hash-tags of FollowFriday.com tradition (#followfriday, #ff, etc..). On January we will post the final world ranking! 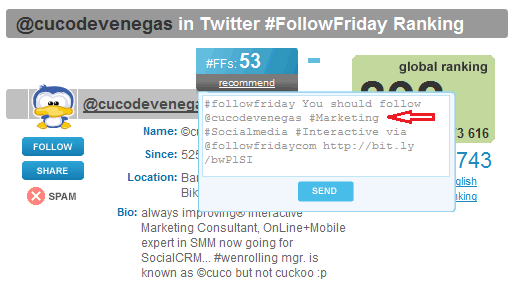 2011 is coming so it's time to summarize FollowFriday.com along 2010. We have selected the 50 most recommended people with #followfriday (or other similar hash-tags) based on Followfriday.com annual history. In this list just appears people, omitting corporative accounts, fan clubs and non personal accounts. We have one more friday in 2010 so we'll post the global ranking the next week. Also we'll publish the annual ranking for the most active countries in the #followfriday tradition. e24apps is really proud to take part in the OneRiot and OneForty Charity Campaign for "clean, safe drinking water for everyone on the planet". Together with other Twitter Apps we want to reach $20,000 in order to sponsor a freshwater project at a school or a health clinic to serve 1,000+ people with clean, safe drinking water. 100% of the proceeds will go to the charity. We hope all of you can help by donating to this marvelous cause. Today we are releasing a major update of FollowFriday.com. We continue to fight the spam on the #followfriday hashtag, so we are changing the ranking rules to reward those shoutouts which are more spontaneous. We are introducing a new points based algorithm where each followfriday recommendation is worth 50 points divided by the number of users recommended in that tweet. So if you receive a followfriday recommendation which only mentions you in the tweet, then you will get 50 points. If the tweet mentions 2 users you will each receive 25 points, and so on. As part of this new algorithm we have stopped taking into account retweets and thank you recommendations. In this way we don't value users who abuse these techniques. We are also introducing a big infrastructure improvement which now allows us to calculate your exact position in the global ranking even if it exceeds 1000. So now our widgets have more sense and reflect your precise position. FollowFriday.com has one of the biggest databases of active Twitter users (> 6 million and growing by 300,000 weekly). A good reason to update your profile is to appear correctly categorized and geolocated in our directory. When you appear in the correct country and language rankings it is a good opportunity for you to be followed by your country and city neighbors. After you sign up on FollowFriday.com you can edit your country, city and language and you can also add 3 categories which complement your bio information. These categories are used by our search engine when someone searches by keywords. Once again it is another good opportunity to expose your profile and be found and followed by users of your sector. The number of users who send followfriday shoutouts using our tools increases every week. For the last couple of weeks when you recommend someone using the “recommend” option we automatically complete the tweet with the user categories. This way your potential followers know your sector and interests which is good for both the recommender and the recommended. 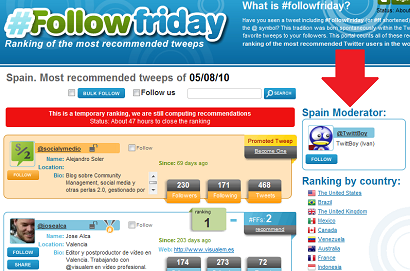 FollowFriday.com is a world ranking of Twitter organized by countries and languages. Like any ranking it’s interesting to be natural and free from manipulations. It is very hard to meet and get closer to every local community from our offices in Spain, in order to watch over the integrity of these rankings. Due to this, we have created a moderators program by countries to help us to look for the ideal people to become our link with the local community and watch over the quality of the recommended lists from every country. Some countries have already their moderators. We’re grateful to them owe to their contribution and pioneer this initiative. In this post, we want to explain some details about this program and launch this call to receive the candidatures by countries. Interested people can introduce their data in this form. Keep the top100 of the ranking free from geolocation ‘mistakes’. Occasionally, our algorithm of geolocation fails because of corrupt or non-sense locations, in this case the moderator must inform us to correct the user’s location. Notify the presence of users suspected of spam. FollowFriday.com is ready to automatically fight against many spamming techniques, but some can be only considered with a manual analysis. The moderator can warn us about these users and we will manually analyze his/her behaviour. Identify users from the moderated country that doesn’t appear in the ranking. It is here where the local moderator may play an important role impossible for us without living in the country or knowing the community. Redirect consults about the ranking. If there would be any doubt about the ranking or its rules, the moderator should redirect consults to any of our support channels. Keep the community informed about news on the project. It’s not about advertise FollowFriday.com, but provide some information about news that may interest the community, such as changes into the rules or new features. Outstanding profile on the ranking web from his/her country including direct Follow key. Continuous information about Twitter accounts from local moderators from our Twitter accounts and blogs. We are very interested our moderators become influential members of his/her community and we will support him/her. Moderators MUSTN’T mediate in quarrels about the ranking. If there would be any doubt about the ranking or its rules, the moderator should redirect consults to any of our support channels. Moderators neither are not wage-earners at FollowFriday.com nor advertise themselves. Speaking fluently the language from the moderated country. Active participation in FollowFriday tradition. Leaving out any spam activity in Twitter, even so in FollowFriday. Speaking fluent English or Spanish in order to communicate with our staff (optional but desirable). Copyright 2010 e24apps.com. Simple theme. Powered by Blogger.